Roasted carrots meet soft cheese (vegan or dairy) and fresh dill to become more than the sum of their parts in this Scandinavian-influenced pâté. Spread it, use it as a dip, spoon it into your mouth when no one is looking. Simple, and simply delicious. When there are “sexier” vegetables around the humbler ones can get left on the shelf. Or, more likely, languish in the back of the fridge waiting patiently for a stir fry to rescue them. I am definitely guilty of that sometimes. Rare is the stir fry at Food To Glow that isn’t preceded by a rummage through the back of the fridge, searching for signs of life. Carrots are pretty hardy in most temperate conditions so are less prone to wastage, but they are still quite underused, even by those who should know better. While we may be quite consistent in pounding back the kale smoothies, and nibbling blueberries as a healthy sweet snack, carrots are often an afterthought. We roast them for a quick Sunday lunch side dish; dip batons of them into creamy hummus; boil fat coins of them and douse with butter; grate them to make cake. To be honest I’ve had a hard time accepting carrots as a legitimate, desirable food stuff. I think I’ve been tainted by growing up seeing too many women of my mother’s generation using carrots as punishment food. Punishment for not being svelte and beach body ready. Even if the beach was only an imagined one. A bowl of cottage cheese studded with carrots was lunch. Maybe even the snack, too. Pass the carrot cake, please. Or rather, pass the pâté. And very recently I’ve been blending roasted carrots with labneh, fresh dill and lemon juice to make a really satisfying and craveable dip and pâté. Yes, craveable. This naturally bright and cheerful looking carrot concoction is fab as a spread, dip and even filling for little phyllo cups (top with preserved lemon and more dill). You could replace the soft cheese with white beans for a less ‘decadent’ spin, although this will change the balance of flavours. Not for the worse of course, but just different. And, it goes without saying, use dairy or plant soft cheese as is your desire. I’ve served this a few times at work to my cancer and nutrition groups. Everyone has studiously scribbled down the recipe, one that I hadn’t bothered writing up as it was just a simple dip thing. I was expecting the light and airy vegan vanilla bean cupcakes with peanut butter frosting to be the big hit. But no, the unsexy carrot spread with the homemade crispbreads was the conversation piece. I’m not sure if that says more about the quality of my baking than the tastiness of the dip, tbh. I will go with tasty dip in this case. Cos those cupcakes were awesome 🙂 Recipe soon. Nutrition notes: This pâté is an excellent source of calcium, fiber, beta-carotene, potassium, phosphorus, vitamin B6, folate and magnesium. Preheat the oven to 160C fan/180C/350F. 1. Cut the carrots into evenly sized batons. I cut medium carrots into 8 pieces. Toss the carrots in the oil and lay on a baking tray. Place the tray in the oven and roast the carrots for 30 minutes, shaking the tray once. Remove the tray from the oven and let the carrots cool for a few minutes. 2. Pot the roasted carrots into a food processor or blender along with the labneh/soft cheese, dill, lemon zest and juice, the salt and pepper. Add the cardamom if using, too. Blend until you get a mostly smooth or very smooth consistency. I like a little bit of texture. You will have to scrape down the sides of the blender or food processor once or twice. Serve as a sandwich filling, with crispbreads (this is my favourite crispbread recipe, slices of rye bread, or as a dip for vegetables. the pâté will keep for a week in the refrigerator. Carrots never looked so fabulous! Root vegetables are often overlooked, this recipe shines a bright light on their goodness. My Food Science labs JUST made pates and forcemeats! Funny, huh? Unfortunately my lab group wasn’t assigned a pate recipe, but it was still cool seeing the other groups create the veggie pates! 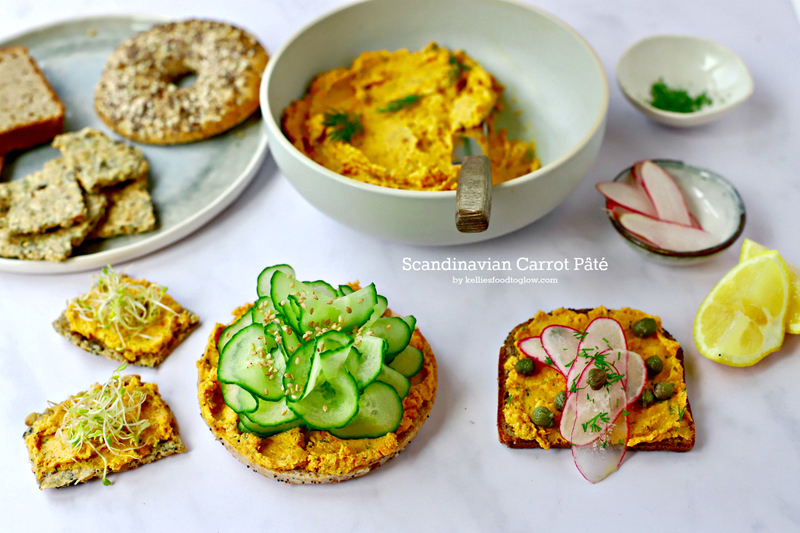 This carrot pate looks so vibrant and delicious. Definitely would try substituting with white beans! I hope you get a chance to make something like this. Spring carrots with just a little dill and some beans is both light and hearty 🙂 What is a veggie forcemeat like? What is it made of? I once tossed some roasted carrots into hummus and they added an unbelievably great flavour, so I can understand the reasoning behind your recipe. Must give it a try with some non-dairy cheese. Wow Kellie, gorgeous pics. I’m honestly drooling over the combo of ingredients in the pate, plus the topping ideas. Filing this one away for a make-ahead snack for the week or an appetizer for a dinner party. Aw, thank you, honey. It is always great to hear from you, Katie. Good luck with your busy next couple of months. Made this.. so tasty, unusual and yum….definitely making again…..very soon. Thank you. Gorgeous pics Kellie and how did you know I had a bag of carrots and a carton of cottage cheese which needs using! !